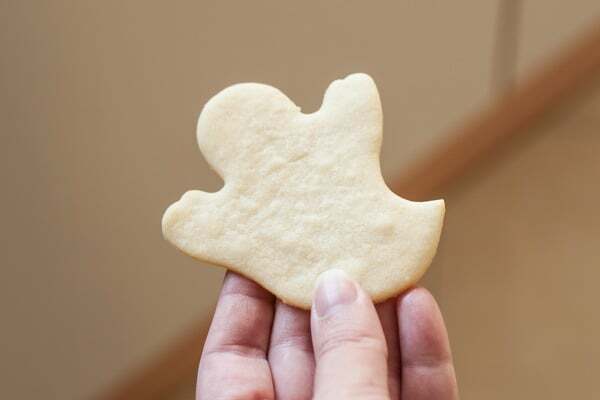 These Halloween sugar cookies are super cute and easy to decorate using delicious cream cheese frosting instead of royal icing. They are the best tasting sugar cookies ever because of one simple secret ingredient that my mom taught me to add to the cookie dough. This is an older post brought up from the archives with updated photos and a printable recipe. Enjoy! I love to bake cookies but I have to admit that rolled sugar cookies aren’t my favorite to make. I’m impatient so I get annoyed that the dough has to chill before you can roll it out. I’m also not very fast with rolling and cutting so the dough sometimes gets soft and sticky before I manage to fill up a cookie sheet. Inevitably I end up with several misshapen cookies. So why do I keep making these cookies year after year? Partly because my mom used to make them every year and I like to carry on the tradition. But mostly because they are my all-time favorite holiday cookie. These buttery sugar cookies with cream cheese frosting are so delicious, they even beat out my favorite Christmas cookies! The sugar cookie recipe is pretty standard with one exception. Most sugar cookies contain only vanilla extract but this one includes both vanilla and almond extract. It seems like a small difference but the almond extract makes these the best sugar cookies I’ve tasted. I’m not sure of the original recipe source but this is the sugar cookie recipe that my mom used for any holiday that required cookie cutters. 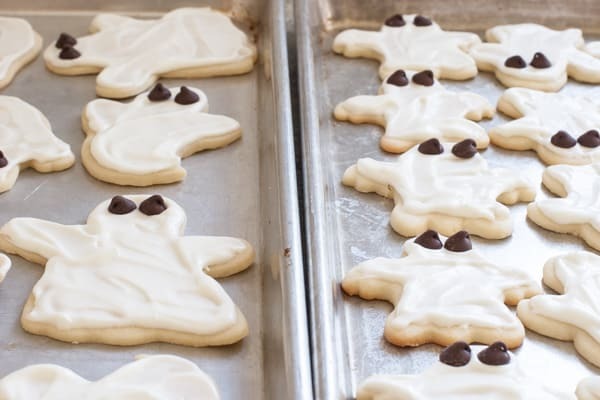 The toppings are the only thing that vary from season to season and Halloween was the only time we would frost the cookies with sweetened cream cheese. Although I did set aside some baking supplies, I did not keep my rolling pin. It’s just too heavy and I didn’t want to pay to ship it to myself in California. So, I made do with a wine bottle. It worked, but I definitely missed my rolling pin! These are some of the cookies that I managed not to ruin! And you mustn’t forget the chocolate chip eyes. Raisin eyes actually taste better on these cookies but I had some chocolate chips in the pantry that need to be used up before we leave. The only issue with frosting sugar cookies with cream cheese frosting is that you can’t stack them once they are frosted. The best way I’ve found to transport them is on large sheet pans with plastic covers (keep reading for more details on this wonderful invention). 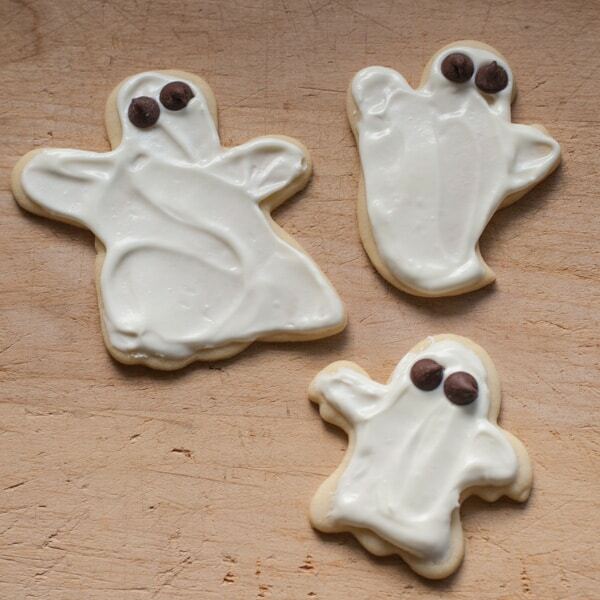 I hope these ghost sugar cookies can become a tradition in your family as well. 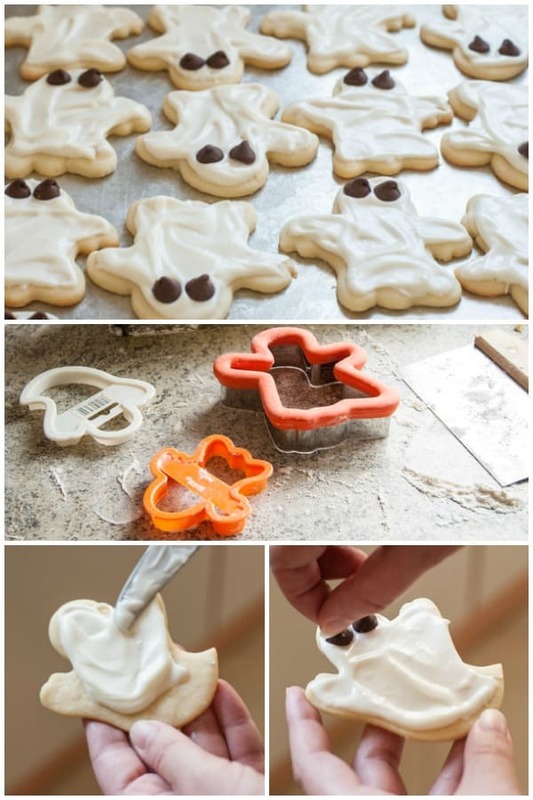 It’s one of my favorite things about Halloween and I plan on baking these with my own daughter in a few years. Now I’m going to tell you a bit more about my new favorite way to transport these cookies and other frosted treats that can’t be stacked! Have you ever seen these cookie sheet covers? I can’t remember where I heard about these, but I have two of them now and they are one of the best kitchen purchases I’ve made in a very long time! They are inexpensive but durable plastic covers for half sheet pans and they perfectly fit all the different brands that I own. 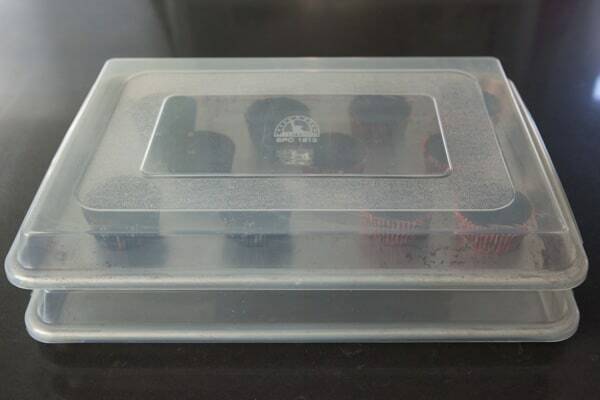 They turn your half sheet cookie pans into stackable and portable containers for your favorite frosted treats. 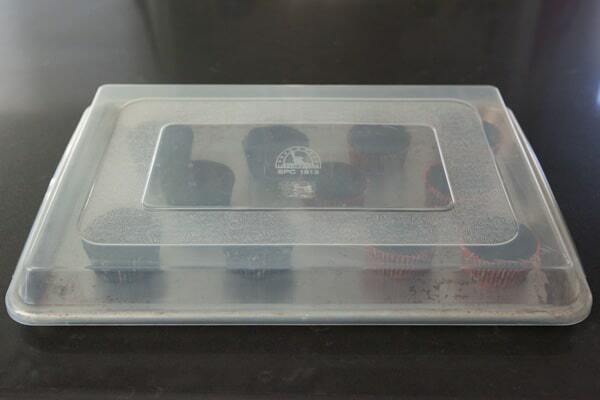 The covers only stick up about an inch and a half above the rim of the sheet pan, so you can’t use them for super tall decorated cupcakes. But they work perfectly for small frosted cupcakes without tall decorations and delicate cookies that can’t be stacked. I also use these sheet pan covers for letting dinner rolls and hamburger buns rise. I use them so much that I’m considering getting a couple more. Now that you know my secret for transporting and storing these delicious frosted cookies, here’s the recipe! 1. In a medium bowl, whisk together flour, baking soda and cream of tartar; set aside. 2. In a separate bowl, use a mixer to cream together butter and powdered sugar until light and fluffy. Add egg, vanilla and almond extracts and beat well. Add flour mixture a little at a time, blending well after each addition until it is all incorporated. 3. Divide dough in half and wrap each portion in plastic wrap or waxed paper. 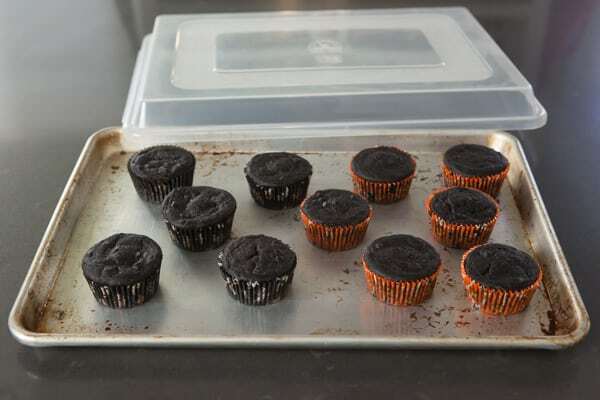 Refrigerate for at least one hour before rolling (several hours is best). 4. 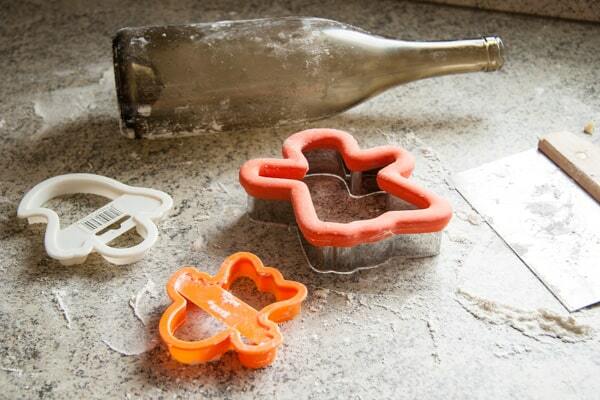 When ready to roll and bake cookies, preheat oven to 375 degrees. 5. Remove one package of dough from the refrigerator, divide that in half and roll out one portion at a time. Roll dough to 1/4-inch thickness. 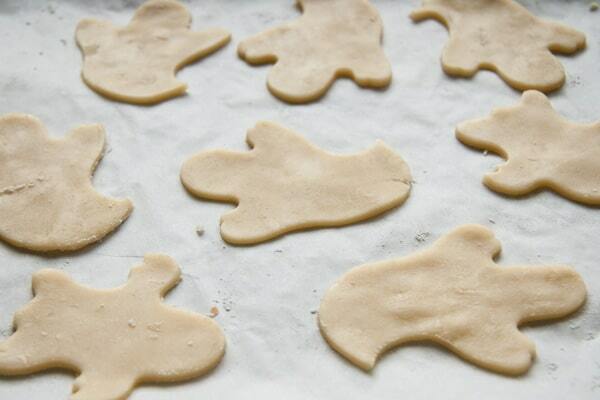 Cut into desired shapes and place cookies on an ungreased cookie sheet. Dough will soften quickly so work fast and always keep the extra dough in the fridge. 6. Bake cookies for about 7 minutes or until just barely starting to color at the bottom. Let cool on wire racks. To frost cookies: Blend together softened cream cheese and powdered sugar. Spread on cooled, baked cookies. 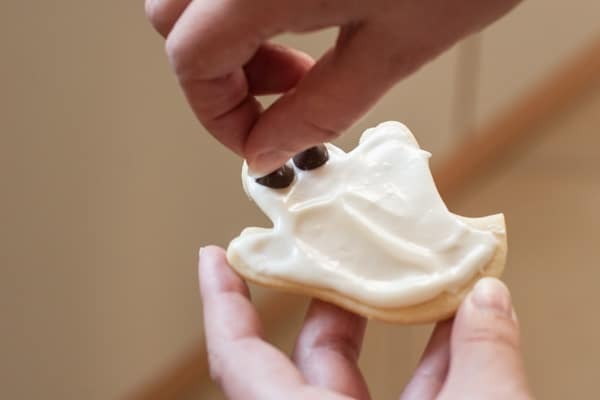 Use chocolate chips or raisins for the ghost eyes. Orange food coloring can be added to the frosting if you want to make pumpkins instead of ghosts. To paint cookies: mix small amounts of evaporated milk with desired food coloring. Paint unbaked cookies with small brushes then bake as usual. The colored evaporated milk doesn't add flavor or sweetness, just color and shine. I'm going to try the almond extract in my cookies next time. That sounds really good!! I'm glad you were able to make them. how fun that this cookie has so much history for you!! not only is it festive for Halloween, but it's a tradition in your family :0) Happy belated Halloween, Nicole! Boo! Those are great! And you're right, it's never too late for sugar cookies. Wow! A friend sent me a link to the Egg Nog French toast and I instantly fell in love with your site! In fact, I made a modified version of your meatballs for dinner last night for my family, some of ate open faced meatballs on french bread and some had noodles with theirs! I have a loaf of french bread to use and a pound of meat ready - i just felt so resourceful and its all your fault! Thanks!!! Nicole, you know what part of this I like best! Adorable! I just turned in a magazine article I wrote about Christmas cookies, and almost all the bakers I interviewed for the story also used almond extract (link is on my blog---article will go online a month after it is published in Dec.). A great tip----I guess that is what separates the best cookies from the average! 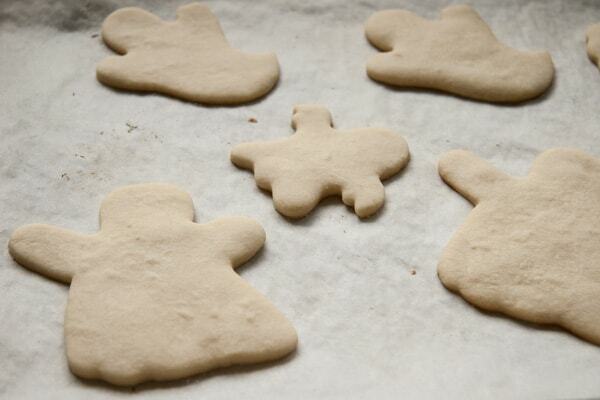 I personally hate making cut-out sugar cookies---but my kids love decorating them, and they are their Uncle Brett's absolute favorite kind of Christmas cookie---so they are a tradition in our house too. I'll have to try the cute ghosts---but not today. My body is still on SUGAR OVERLOAD from last night. YUCK! Bethany: Yep, it's just a small change but makes such a big difference in the taste!OmegaMom: Yes, I saw that today and I'm pretty excited about it! I don't know much about the awards but I'm against some pretty stiff competition in the food blog category!Ruby: Eh, they were kinda fun but kinda annoying too! The dough kept sticking to everything and quite a few cookies ripped while I was trying to get them from the counter to the cookie sheet!Deborah: The almond extract really makes a big difference, hope you like it!VeggieGirl: Happy belated Halloween to you!Lydia: Thanks!Steff: Welcome! I'm so glad that you're enjoying the site and that you're trying some recipes! I haven't made the meatballs in a while...sounds good!Curt: I actually thought about you when I was frosting the cookies today!The Secret Ingredient: Can't wait to read the article! I'm on sugar overload, too! Unfortunately we still have tons of Halloween candy left! It's never a bad time for a sugar cookie recipe! And with a little changes to that svelte figure---we've got snowmen! clumsy: That is such a great idea! I know I have some snowman cookie cutters packed away somewhere, too! I bet I know the recipe's original source! It's almost identical to the Deluxe Sugar Cookies recipe in the Betty Crocker cookbook. (I have my mom's old 1973 edition.) The only difference is that the Betty Crocker recipe calls for 1 teaspoon soda instead of 1/2 teaspoon. We make them every year and they're wonderful! I love the cream cheese frosting idea. Tara: You're probably right! I think my mom's Betty Crocker Cookbook was probably from the same year, too! Those really look wonderful! I'd gotten so used to seeing poured royal icing on sugar cookies that I forgot how much I like the look of hand-spread frosting. Yum! Thank you so much for sharing this recipe with us! 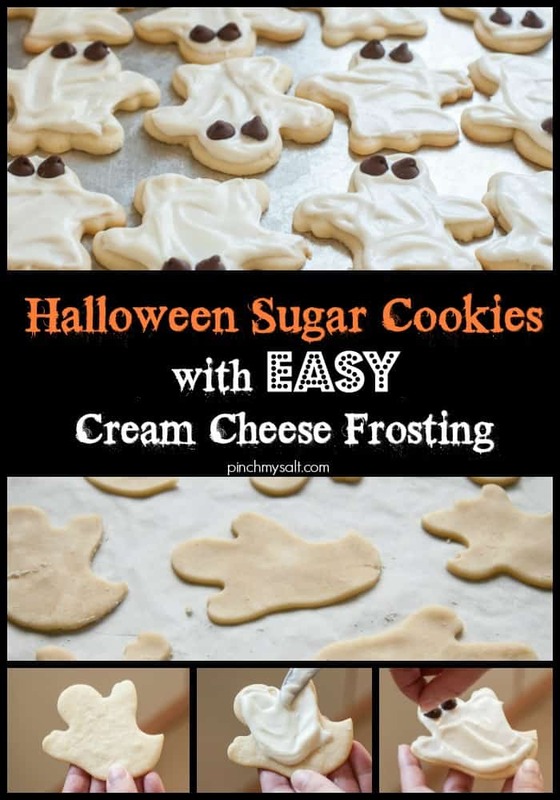 i'm not such a fan of rolled sugar cookies, but i totally want to give these a try...for christmas most likely! your description sounds lovely and iced? oh my! Oh, I love the cookie cutter with the plastic (or is it rubber?) top. Little chance of hurting the hands while cutting the dough. Connie: I love that one, too! It does have a rubber grip and I think it's made by Wilton, but I can't remember. The only problem is that it's so big! Somehow it feels more satisfying to be able to cut out more cookies at once by using the smaller cutters. I guess it has something to do with the fact that I struggle so much rolling out the darn sugar cookie dough! But I did use the large one to make a few big ones (the very first photo was cut with that cookie cutter). Hey Nicole- Loved this post, mostly because I remember making these with your mom. The raisin vs. chocolate chip debate was usually settled by what was on hand. But I remember the almond extract flavor more on the Valentine's Day cookies, isn't that funny ? Maybe that is the first cookie she tried the almond extract on. I even remember her commenting on how good it was. Just stumbled upon your site and love these cookies! This is going to be perfect for next Halloween. Thanks! Thank you for the recipe! I can't wait to make these cookies... I'll probably make them for my Halloween party! Fantastic Recipe My Girl!! Much thanks! Beautifully done blog entry. The photos are great and my mouth is watering! i wish I'd found this before Halloween. I will bookmark it for next year. I LOVE frosted sugar cookies, but mine are always inconsistent - sometimes crispy, sometimes soft. How should these turn out? I like the idea of both extracts in the dough and I'll give this recipe a shot myself - it's very close to my mother's recipe - which I have yet to duplicate properly. My brother was born on Halloween and will be 70 years old this year, so I'll have to make some for him since I'm his big sister.Would cutting them out on no-stick foil work so they wouldn't come apart? Just a thought. I am going to have to give this recipe a try. My sister does something that you might find helpful with the rolling, she divides the dough in half as instructed and rolls each between two sheets of wax paper and chills for the hour, then peels off top layer (setting aside) and cuts out cookies. Then she re-rolls the dough and puts back in the fridge. After these are baked and pan is cooled a bit, she pulls out the SECOND batch of dough and does it again. By rotating it in the fridge, she is always working with chilled rolled dough and her cookies are perfect. I made these cookies, and they're delicious...my only question is, doesn't the cream cheese frosting need to be refrigerated? I don't really want to refrigerate the iced cookies, but I don't want anyone to get sick. These are wonderful! I'm 78 years old and quit making sugar cut-out cookies when my children were young. I can't imagine where the negative comments came from. I found absolutely nothing wrong with this recipe. I did find that working with smaller batches works much better. The dough does get soft rather quickly, so rolling smaller batches helps that problem. And rolling the dough on parchment paper on the cookies sheet ...... genius!! I did have to move the cookies around some to give more room when baking, but so much easier to slide the cookies on the parchment rather than lifting from the counter to the cookie sheet and trying to keep the original shape. The flavor was good also. It's still not my favorite thing to do in the kitchen, but will now try them again. Thanks for the recipe and all of the wonderful tips.